I've just seen Sandra Bullock's The Proposal movie and I've really enjoyed it. Ever since I started this mobile phone blog, I got into the habit of checking out the mobile phones featured in movies. Batman's phone for example, in the Dark Knight turned out to be the Nokia Tube. Anyways, it seems that Nokia has been dominating the movies when it comes to mobile phone marketing with their appearances in hit movies such as Charlie's Angels, The Dark Knight, Star Wars, and who knows what else. LG follows close behind with LG phones appearing in movies such as Iron Man and Transformers 2. Well, in the proposal, you'll notice that Sandra is on her mobile phone a lot of times, it's white and has a silver battery cover. Well, it's actually the Nokia E71 mobile phone. 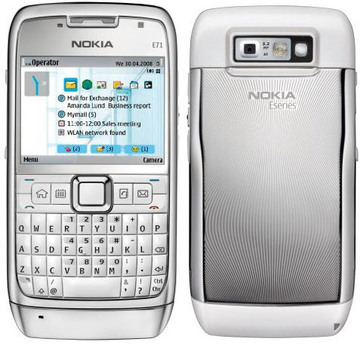 The Nokia E71 is not the latest mobile phone in Nokia's roster of phones, in fact, it would soon be replaced by the Nokia E72. I'm sure a lot of working women will have their eye on the Nokia E71 after Sandra used it in the movie. I have to admit, the white E71 does have its appeal and it's not a bad phone too with 3G, WiFi, GPS, and a 3.2 megapixel camera. Ryan Reynolds on the other hand is using a Nokia flip phone: the Nokia N76, in black. The Nokia N76 is a RAZR like mobile phone but since it's an older model, specifications are not that great with no 3G, WiFi, or GPS and only has a 2 megapixel camera. Thanks, Ari. I enjoy putting my knowledge of mobile phones to the test and identifying phones in movies. I'll try to do more similar posts in the future.